Between us, we’ve waited for jobs, spouses and places to live. We’ve waited for houses to sell, businesses to take off and wayward children to come home. We’ve waited in exam rooms and by hospital beds. We’ve waited for healing of broken marriages and broken bodies, addiction and despair. Some of us have longed and waited for years for a child to call our own. We wonder and hope, wrestle and doubt, pray and long, and sometimes as we wait, discouragement rolls in like thick fog blanketing everything it touches. It disorients and blinds and skews our sight line until we lose perspective and feel the weight of its dewy whiteness settling all around us. This year we have waited. We waited for days in a hospital by the side of our boy hoping he would be ok.
We have waited, week after week and month after month for a job. And I must confess, that as we’ve waited, I have allowed the dewy whiteness of discouragement to take hold more than a few times. I fall to my knees beneath its weight. There on my knees crying out for help, I realize that my gaze is fixed on the thing I am hoping for rather than the one who is my hope. My hope is the beginning and the end, the author and perfecter of my faith, the giver of every good and perfect give, my redeemer and savior, my comforter and friend. My hope is Christ who came to seek and save the lost. There on my knees, beneath the weight of discouragement and despair, he lifts the thick dewy fog from around me and reminds me. 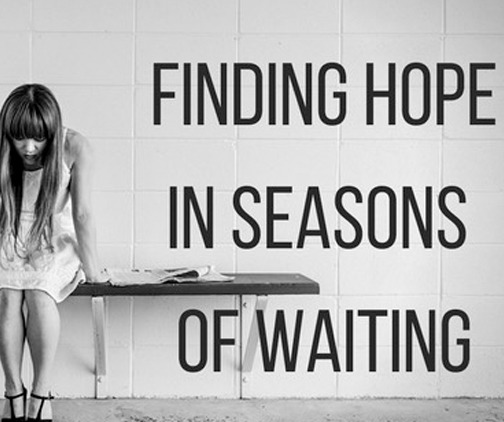 Dear friend, if you are in a season of waiting, I pray that you would experience the presence and peace of Christ as you wait. I pray that he would fill you with hope as you fix your eyes on him. Thank you, Lisa. I am so glad that you found it encouraging. I’m thankful for how God works through waiting to reveal more of himself to us.